The Japanese automaker Nissan seems all set to debut all-new Nissan GT-R in 2018. This was affirmed by Shiro Nakamura, Chief Creative Officer of Nissan Motor Company, while speaking to the British automotive magazine, Top Gear. Lethal performance from Nissan GT-R helped the model to flog the Lamborghinis and win the King of the Streets competition at Texas Invitational. There were Vipers, Nissan GT-Rs and the highest-power Lamborghinis participating in the competition. These 42 street-legal race cars only raised the benchmark of the racing competition. Alpha Omega GT-R, which was built and driven by Ivan Phipps, won the competition. The 3.8-liter twin-turbo V-6 created 2,000 hp and had enough power to set a new 1/4-mile. 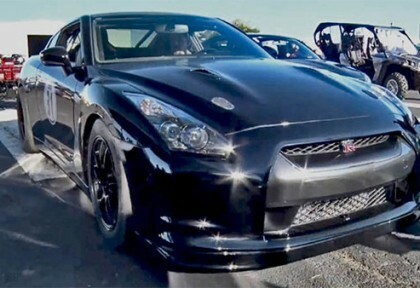 GT-R drove at 7.7 seconds/186 mph. 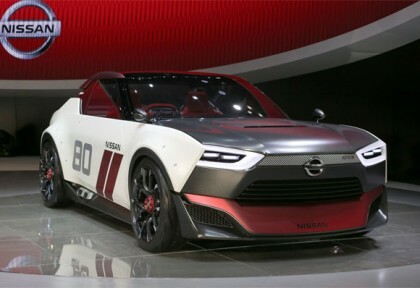 The executives at Nissan did not expect the huge amount of interest they received from consumers, automotive websites, and even Jay Leno when they released their Nissan IDx Concept sports car. None-the-less, what they appear to be gambling on is that they can make it even better. 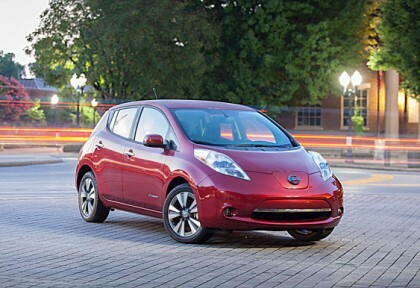 This is great news for all those new Leaf owners, as they can now charge their cars for free across the country at any of the thousands of public charging stations. Called – No Charge to Charge program, the new program will go on for 2 years. 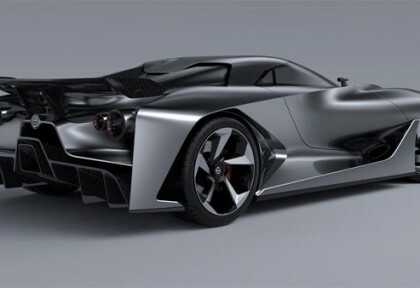 Nissan has posted a teaser on Twitter according to which they will reveal Gran Turismo Vision Concept today for GT6. 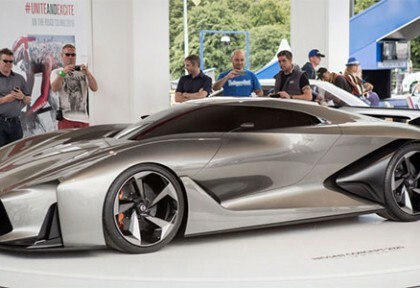 Nissan will not be the first automaker that unveiled Gran Turismo Vision concept, recently we have seen Volkswagen’s GTI Roadster and prototypes from BMW, Mercedes and Mitsubishi. What makes Nissan different from most others is, it might be a production model of next GT-R.
Nissan announced a redesign version of its iconic black taxi in London, while the segment is these day dominated by a Chinese automaker Geely. Nissan made the taxi more recognizable that anyone can instantly recognize the vehicle. The taxi is specifically developed for London by Nissan Design Europe (NDE) in Paddington, London, the same design center where Nissan Designed its popular Juke and Qashqai. The new taxi features a 1.6 liter petrol engine mated with an automatic transmission for efficient performance. Nissan claimed that in the comparison with the current diesel engine, the new petrol engine will be cleaner and produces low level of Nox. The redesigned version of the London taxi will be available for sale in December 2014 while the company has plans to introduce a zero emission electric version of the taxi in the next year. 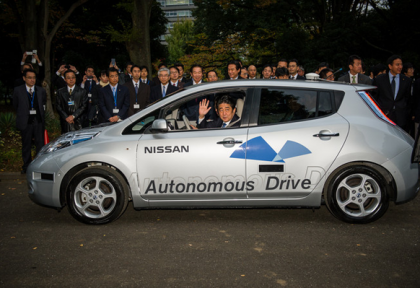 Shinzo Abe, the Prime Minister of Japan, drove the all-electric Nissan LEAF vehicle last week to mark the beginning of Nissan’s revolutionary Autonomous Drive test car. Nissan LEAF is the first car to possess the Autonomous Drive capability and has been granted a license plate in the country. The vehicle was driven around the roads of Japan’s parliament, the Imperial Palace and the National Diet Front Garden, which is a public park located in the middle of Tokyo. Nissan is all smiles these days. The company has officially released word that the new NV200T taxicab is now in service in the streets of New York City. The meter on the new cab officially started rolling at JFK International Airport on October 23, 2013, dropping the first passenger to 13th street, 6th avenue in Manhattan. 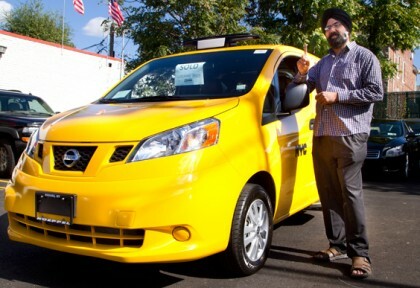 Ranjit Singh, a proud owner of the all-new Nissan NV200T taxicab with Medallion No. 7F20 drove his first passenger from Koeppel Nissan in Queens on the 18th of this month. The Ni9ssan’s Micra has been there on the market since 1982 and is basically a supermini car. Unfortunately, the Micra has never been become a class leading car in the segment because Nissan never upgraded this cute mini car thoroughly. Well, good news for the lovers of superminis is that, Nissan finally gave a face lift to the Mica inside out to make something that the rivals will consider seriously in their competitor list. 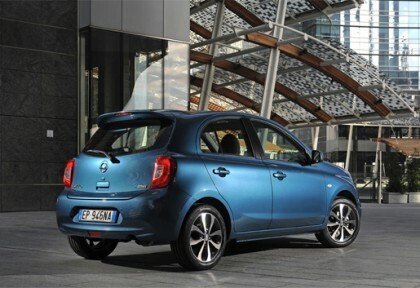 The new Micra is the fourth generation model that is attractive and sophisticated than ever. No changes are made to the engine and other mechanical parts of the car. The commercial vehicle market is also booming and therefore many automakers are now concentrating on introducing some of the best light weight commercial trucks across the globe. Nissan has been playing a pivotal role to introduce better commercial vehicle trucks and now the automaker has decided to introduce NT500 trucks that can offer better convenience and options to commercial light weight vehicle owners.